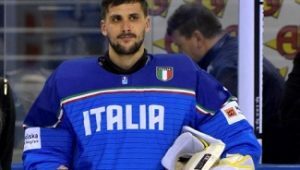 April 28, 2018 / NationalTeamsOfIceHockey / Comments Off on Great Britain & Italy up! “We are going up! We are going up!” the British fans chanted on the tribune. 15.8 seconds were missing in regulation time that changed everything. For a long time it looked like host Hungary would win the game in regulation time and get promoted together with Kazakhstan in a four-team tie at nine points. But the last-minute bounce made Great Britain tournament winner and Italy will be promoted too as second-placed team. After the 2-2 tie the rest of the game wouldn’t change anything anymore but Great Britain continued its party on the ice by beating Hungary in shootout with Ben O’Connor scoring the winning goal in the fifth round. Great Britain tried to get into the game for most of the time and outshot Hungary 43-33. It was the fitting ending of a tournament that was full of drama, surprises and a tight standing from the first to the last day, to the last game and the last minute. Five teams were still in run for promotion before the final day and four teams could still have made it before the last game’s result. For Great Britain it will be a return to the top division after 24 years. And like in the ‘90s they made it from the third to the top tier with two consecutive promotions. While Hungary and Italy will be promoted to the 2019 IIHF Ice Hockey World Championship in Slovakia, Kazakhstan had to settle for bronze before Hungary, Slovenia and Poland, which will be relegated. In front of a loud and passionate sell-out home crowd of 7,870 spectators Hungary had a perfect start also thanks to a tripping call against British goaltender Ben Bowns. At 3:31 the Hungarian players covered him with shots and had several rebounds until Christopher Bodo eventually succeeded and beat Bowns for the 1-0 goal. The British had their chances too but didn’t manage to create enough danger to tie the game. In a scoreless second period Daniel Koger had the probably best chance for Hungary when Bowns deflected a shot with his hands. A bit later on the other side Adam Vay had to be sharp when Mark Richardson shot after a great pass from Mike Hammond. A lucky bounce gave Hungary the 2-0 lead at 1:53 of the third period. Janos Hari brought the puck high to the crease where it hit Csanad Erdely’s shoulder and from there went in. The goal was confirmed after a video review. The British still continued to work hard and when they were looking for a rebound Robert Down eventually broke the spell and beat Adam Vay for the 2-1 goal with nine minutes left for GB to tie. The British were pushing but the best chance was Hungary’s when Hari missed out on a penalty shot with four minutes left. The Hungarians seemed to win it and to go up with Kazakhstan. But then, with 15.8 seconds left a nightmare broke out for the hosts. The British occupied their zone, had their time-out and their goalie pulled for a sixth skater. Farmer brought the puck from a sharp angle to the goal and surprised Vay. The puck slid down from his glove and slid across the goal line. It was 2-2. Now suddenly Great Britain would be tournament winner and take Italy as second-place team to the top division. It was not over yet. Now Hungary took its time-out. With eight seconds left and after a glove block from Bowns the fans started to cheer after a rebound but the puck just came onto the net from outside. Great Britain won and the players and the “Barmy Army”, their loud fans on the ice, celebrated loudly. It was the start of the British party while the Hungarian fans chanted farewell to their visibly broken players with the traditional singing of the national anthem as they do even in defeat. 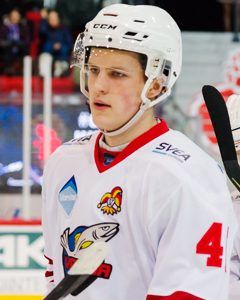 In the battle of the Baltics, Pavilas Verenis scored a brace while blueliners Nerijus Alisauskas and Jaunius Jasinevicius scored one apiece as Lithuania went undefeated through the 2018 IIHF Ice Hockey World Championship Division I Group B in Kaunas. Lithuania’s 4-1 final day win sealed their promotion to the 2019 IIHF Ice Hockey World Championship Division I Group A. Japan finished second to win silver while Estonia slipped down to third in Division I Group B. “I think one of the biggest influence to our success was the arrival of Darius Kasparaitis and Dainius Zubrus to our team. We had read about them, but we never had them together in our locker room. We have a good team, but those two guys made the difference,” said Lithuania’s captain of the evening, Mindaugas Kieras who played his 100th and last game for Lithuania this evening. Robert Rooba got Estonia’s marker as they went ahead before conceding four straight unanswered goals. Villem-Henrik Koitmaa recorded 39 saves and was voted the best goalkeeper of the tournament by the Directorate. “They guys gave it all and I am very proud of them. You could see right after the game that the players are disappointed as there was so much at stake. In the third period we still had chances which could have gotten us close, but tonight we lost against worthy winners and the best team of the tournament” said Estonia’s head coach Jussi Tupamaki being gracious in defeat. The clash got off to an intriguing start as it was the surprise package Estonia that got in front. Lithuania’s netminder Mantas Armalis had lost his stick when Rooba surprised by snapping a trademark wrister from the left boards after 4:20 for a shock lead that helped settle Estonian nerves. “It was such an important game for gold or bronze, and I’ve never played in front of so many people so it was a bit nervous, but when you got into the game it was ok,” said Estonia’s Artjom Gornostajev. The lead only lasted for just over three minutes before Zubrus won a draw and Alisauskas hit a bullet from the blueline for this first of the tournament to tie the game at one. “I was impressed by Estonia, they have a young team now and new guys stepping in and playing really good hockey without trying to make any mistakes. We knew they were a good team, but we felt that they would have to do something extra in order to take the win away from us,” said Kieras. Winning the shots in the first frame 14-7, Lithuania went in front when Daniel Bogdziul fed Jasinevicius who lofted a shot past Koitmaa for 2-1 after 15:42. With Verenis serving a cross-checking minor at the start of the final frame, Estonia piled up the pressure on powerplay with Robert Arrak and Andrei Makrov both denied by Armalis. 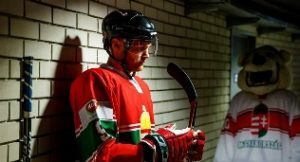 Georgian hockey is celebrating after the former Soviet republic produced its best-ever result in IIHF play to win the Division III title in Cape Town. The mountainous nation, high in the Caucasus, only played its first internationals in 2010 and competed in IIHF events for the first time in 2013. For two seasons, it could not manage a single victory, but those struggles were all forgotten after four wins from five games in South Africa secured the sought-after gold medals and elevation to Division IIB. The change in fortune came namely thanks to Russian-trained players who have joined the Georgian national team in the past two years. Of the five best scorers three have names hailing from Russia or Ukraine and all five learned their hockey abroad. The tournament’s scoring leader Alexander Zhuzhunashvili originally came from Moscow to play for the country of his ancestors and made it to the second-highest junior league MHL-B in Russia. Also Alexander Vasilchenko, Artyom Kozyulin and Artyom Kurbatov played their hockey in Moscow while Oliver Obolgogiani, second in scoring, played junior hockey in Finland, and goalie Andrei Ilienko is a native of St. Petersburg. The free-scoring offence put Georgia in control of the group. The country started with a 6-2 win in a neighbouring clash with Turkey and followed that up by beating Bulgaria 5-3. Next came a crushing 11-1 demolition of Hong Kong before a stumble against the host nation saw South Africa win 4-2 and threatened to halt the promotion parade. Going into Sunday’s final round of games, Georgia knew that it had to defeat Chinese Taipei or be overtaken when Turkey and Bulgaria played later that day. In the event, there was little to worry about. Zhuzhunashvili opened the scoring after just 17 seconds, potting the first of four goals for him in the game. Defenceman Artyom Kurbanov doubled the lead soon afterwards and Georgia was looking comfortable. There a momentary wobble: captain Vitali Dumbadze took a 5+20 for a high hit and Taipei got one back on the PP, but Semyon Kharizov hit back with a short-handed goal to calm the alarm. Once the teams were back to equal strength, normal service was resumed: Georgia jumped to a 5-1 lead at the end of the first period and added three more in the two remaining frames. Kharizov completed a hat-trick, Zhuzhunashvili completed his four-goal haul with a short-handed marker four seconds from the end. The final score was 11-2, with Yen-Lin Shen and Po-Yun Hsiao getting the consolation goals for Chinese Taipei. The earlier head-to-head results meant that nobody could catch Georgia now. Bulgaria pipped Turkey to bronze with an overtime victory and South Africa safely navigated a potential relegation showdown against Hong Kong by winning 6-0. But this tournament was all about Georgia’s historic triumph. The team was led by the free-scoring Zhuzhunasvili, one of several Russian-Georgian players on the team. A generation earlier than him, head coach Roland Svanidze underwent a similar journey, starting his career as a player of Georgian descent at Metallurg Novokuznetsk before a stint playing in Dubai and a move into coaching with the Georgian national program. However, this is no mere team of imports playing under a flag of convenience. Most of the roster does indeed have Georgian names and many players come from the domestic system. So where does Georgian hockey come from? There is a Soviet history to the game here: the first recorded appearance of a Georgian team dates from the Winter Spartakiad of 1962, where Soviet Georgia competed in a kind of Winter Olympics for the republics of the USSR. At the competition in Sverdlovsk, now Yekaterinburg, the team defeated the Armenian and Kyrgyz SSRs but lost to the Kazakhs and all three Baltic republics. The modern-day team is entirely drawn from the country’s four-team national championship. The bulk of the players, perhaps surprisingly, do not represent the three teams from the capital, Tbilisi, but come from Mimino in the small mountain village of Bakuriani. That community of 2,500 people high in the Borjomi region is something of a winter sport’s hub: a popular ski resort, it was also home to Nodar Kumaritashvili, the luger tragically killed in training at the Vancouver Olympics in 2010. Mimino supplied 11 of Svanidze’s 20-man roster for Cape Town. Although the early days of Georgia’s new hockey era were tough – no wins in two years of IIHF competition and a chastening -75 goal difference in 2014, then a disqualification in 2016 for selecting ineligible players in Division III in Istanbul – the team has progressed quickly. Last year’s event in Sofia saw the team claim bronze, with only a group-stage loss to eventual champion Luxembourg denying the team a place in the gold-medal game against host nation Bulgaria. With something to build on, Svanidze and his team refined their plans. In 2018, the efforts paid off: a sparkling performance in South Africa secured promotion for the first time and a highest-ever World Championship ranking of 41st. Russia’s Ak Bars Kazan won the Kontinental Hockey League’s Gagarin Cup for the third time in its history on Sunday with a surprise 4-1 series win over CSKA Moscow. Ak Bars won Game 5 1-0, with ex-Edmonton Oilers wing Rob Klinkhammer scoring the winning goal on the power play early in the third period. Emil Garipov stopped 33 shots for the first shutout of the finals. It was the first Gagarin Cup since 2010 for Ak Bars, which won the title in the KHL’s first two seasons but hadn’t won since. Ak Bars was considered the underdog since CSKA’s roster included eight of the Russian players who won Olympic gold in February, with Ak Bars having none.